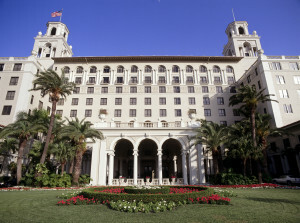 Your office might not look like The Breakers in Palm Beach, FL but it should look inviting. The landscaping around your office or home says a lot about you. It of course has signs and directions informing people what kind of business you are, where they enter, drive, park, etc. However, subliminally it says how much care and attention you pay. If you pull up to a business which is run down or poorly maintained, it does not speak well to the level of excellence one can expect from that company. This may not be altogether true, however, it is certainly a common impression people get. With this in mind, it’s important to keep your office’s landscape looking sharp, and to mix it up every once in a while with a new addition. Here are some ideas. When analyzing your landscaping, start with the entrance. It makes the biggest impression, is the most commonly seen, and is annoying when it is hard to find. While you should follow architectural and landscaping consistency, remember the main goal is to make the main entrance of the building as obvious and inviting as you can. This is best accomplished by adding things which attract the eyes like bright colors. A simple flower bed is a good balance between uncluttered and attractive. For instance, if your lawn requires a retaining wall, a small flower bed atop the wall would catch the eye while remaining out of sight. A well-marked, well-lit, nicely designed entrance will impress your clients and business partners. Although you don’t want to go too crazy with decorations surrounding your entrance, they are a great way to use the space around your building’s lawn or driveway. As a true business person, get the best “return on investment” by picking a plant or shrub which does not require a great amount of care. You are not going to want to water plants daily. Plants are a great way to add some color and variety to your facility. Let’s face it, most offices and company properties are not terribly exciting. They are designed for efficiency and production so a well-planned landscape can really make your business stand out from the competition. Another great idea is to add furniture and accessories to increase the character to your outside space. There are new trendy looking pieces to go with classic and antique looking designs to suit whatever your style is. In addition, functional furniture like benches, chairs, and tables come in handy whether it’s the public or your employees who need to sit down. Depending on your business, this could pull potential customers toward your entrance. As a final touch, you should consider adding some lawn ornaments, like garden statues, or modern pieces of art. At Greener Horizon in Middleboro MA, we understand the planning and strategy which goes in to landscape design is not only vital, it can be intimidating. If you need help deciding what to do in regards to your lawn, gardens, or any other landscaping services be sure to contact our expert team. We will walk you through the process, answer any other landscaping questions you may have, and schedule a complementary consultation.